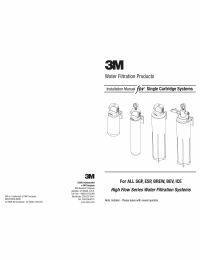 3M™ Water Filtration Products Model HF90-S-SR5 is a single cartridge that helps provide consistent high quality water for commercial ice by reducing the effect of sediment and biofilm at flow rates up to 5 gpm. Built-in scale inhibition reduces the ability of calcium and magnesium to precipitate on the evaporator plates as hard scale. The HF90-S-SR5 cartridge uses a patented multi-zone, polypropylene pleated media which provides exceptionally high surface area. For low flow cubers to 1,450 lbs. For high flow cubers to 1,000 lbs. For flakers to 2,400 lbs.